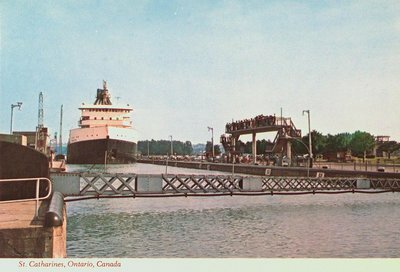 A postcard showing Lock Three of the Welland Ship Canal fourth canal)on the St. Lawrence Seaway, St. Catharines, Ontario. The image is looking south at a ship traveling north towards Lake Ontario. c1970. Published by Emsales, Peterborough, Ontario. Printed in Canada.